Is your home looking a little cluttered? Whose isn’t! Home organisation often seems like a downright mystery. No matter how hard you seem to try, the stacks of odds and ends around your home just keep growing. But don’t despair! With a little bit of clever thinking, you can turn the tide on your home organisation. With the right approach, you can implement home organisation systems that are largely self-administering! If we told you that a few strategic storage solutions is enough to clear almost every bench in your house, would you believe us? The idea of a clean and clear house seems almost unattainable to some homeowners, but we assure that it’s easier than you think! So read on and discover a few of the best-kept secrets in home organisation! 1. Our best tip is also the hardest: let go of the things you don’t need! We put this tip first for a reason: it is the hardest. But it is also the most important. The key to home organisation is having what you need, and no more! Of course, we don’t mean ditching everything and living a minimalist life devoid of material things! Rather, we are talking about getting rid of those things that you just don’t use anymore. Whether they are broken, out of date or just obsolete, they are the things that really clutter your home. If you do one thing in your fight for home organisation, it should be getting rid of these belongings. A great way to get yourself in the right frame of mind to undertake such a job is to donate the things that are still functional. If you can convince yourself that getting rid of your unwanted possessions will help someone in need, it will be much easier. Once you have dealt with all the unwanted bric-a-brac around your house, you have pretty much already won! So you’ve done it – you’ve donated all those unwanted bits and pieces that have been cluttering your house for years. Congratulations! But don’t rest on your laurels just yet. Take advantage of your progress and get ahead! A good way to do this is by setting up creative storage solutions with your newly reclaimed space. Corners of the garage that are normally full of stuff might be better suited to a new set of shelves or a cabinet. The chest at the foot of your bed that’s empty now might be more useful with some dividers in it. Little things like that can prevent bits and pieces from piling up. If you divide your available storage space into manageable compartments, you can keep track of what goes where. This means that you will be more inclined to store things in an organised manner, even when you’re in a rush! And if things start getting on top of your again, not a problem! Simply go back through your compartmentalised storage spaces and ditch the things that don’t belong. 3. Cutting down on plastic bags will stop them from overrunning your kitchen cupboard! Almost everyone is guilty of hoarding plastic bags. They just seem to pile up after every trip to the supermarket – sometimes, they come in faster than you can use them! So what do you end up with? Well, in all likelihood, you have a cupboard somewhere in your house dedicated to a growing pile of plastic bags. But this is problematic for a whole host of reasons. Firstly, it is bad for the environment. An oversupply of plastic is never good news and getting rid of plastic bags responsibly is hard to do. And secondly, plastic bags are very hard to store in an organised manner. They spill all over the place, end up in obscure places and generally occupy more space than they need to. So what’s the solution? There’s only one: cut down on your plastic bag uses. It is far easier to store a single reusable shopping bag than it is to store 50 plastic bags! Better still, it’s far more environmentally friendly. And, as more states consider plastic bag bans, it can save you some money down the track too. Another thing that is a storage and home organisation nightmare is paperwork! Bills, forms, letters and mail all pile up almost unstoppably. And as our lives get busier, dealing with these stacks of paper gets harder and hard. But there is a straightforward and effective solution: get a filing cabinet! Filing cabinets are a great way to divert the endless stream of paper in our lives to somewhere manageable. They come with alphabetical indexing systems and multiple compartments, so you can file away your paperwork and find it again in no time! Another great benefit is security. Home organisation is great, but security is just as important – especially when it comes to letters from the bank or government. 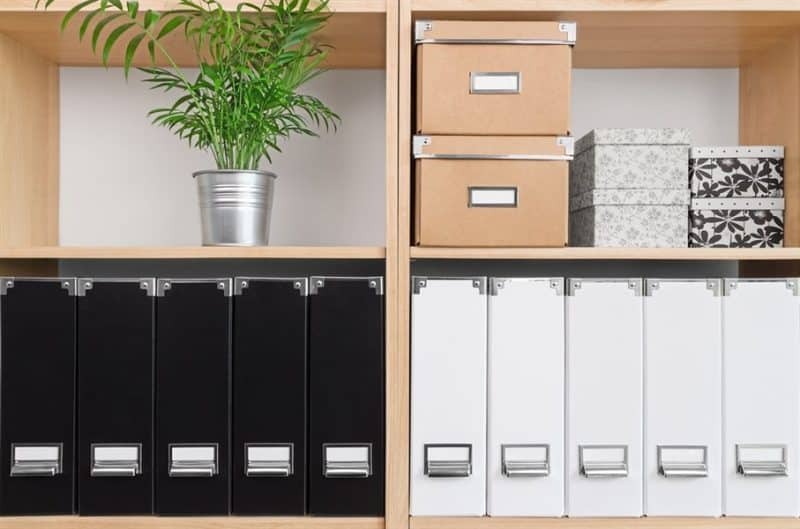 With sturdy locks and great indexing systems, filing cabinets have it all! If your pantry looks like most, then there is probably a plethora of food products stored without rhyme or reason. Such is the unavoidable reality of almost everyone’s pantry! But is it so unavoidable after all? With storage jars, it is very avoidable indeed! Jars seem almost too simple to think of, and that’s probably why they’re so often overlooked. But the simple solutions are often the best, and this is certainly the case when it comes to home organisation in the pantry. Separate jars for your flour, tea, coffee, rice and whatever other food products you have are a great way to get some order into your pantry. Jars come in a wider variety of shapes and sizes than other storage products such as Tupperware. And, undeniably, jars look better! They can give your home a very pleasant ambience and they are just as much a home decorating tool as a home organisation one!